THE SUN 22/12/2018 PAGE 42. VANGUARD 28/12/2018 PAGE 25. TELEGRAPH 29/12/2018 PAGE43. THE NATION 6/1/2019 PAGE 13. Nigerians should take note that the following governorship candidates will win in their respective states. Babagana Zulum of Borno State, David Umahi of Ebonyi State, Abubakar Bagudu of Kebbi State, Nsima Ekere of Akwa Ibom State, Abdullahi Ganduje of Kano Sate, Ben Ayade of Cross river State, Aminu Bello Masari of Katsina State, Babajide Sanwo-Olu of Lagos State and Nasir El-Rufai of Kaduna State. Progressive Congress will win 2019 Presidential election. You may not like him but that is the truth. I therefore urge the religious leaders in the country to refrain themselves from making inflammatory utterances that promotes conflicts and disunity because God gives power to whoever He pleases. NOTE: Prophecy is a warning and a clue to the plan of God. it can be prevented if the right steps are taken. “Governor’s forum in Nigeria will mourn before the end of year 2012. I am urging them to fast and pray as one of them will die in a mysterious manner. Daily Sun – 19/1/2012 page 38. The Nation – 22/1/2012 page 69. Amongst Others. Lagos – Nigeria, West Africa. Lagos-based Cleric and Founder of Christ Deliverance Ministries-CDM, His Grace, Prophet Ekong Ituen, is one of the major Prophets whose prophecies have shaken the high and mighty. His accuracy on prophecies has made him a force to reckon with. It is on record that before 2019 presidential and governorship elections in Nigeria, Prophet Ituen predicted the results that came to pass. Below were his prophecies as published in National Dailies: THE SUN 22/12/2018 PAGE 42. VANGUARD 28/12/2018 PAGE 25. TELEGRAPH 29/12/2018 PAGE 43. THE NATION 6/1/2019 PAGE 13. Nigerians should take note that the following governorship candidates will win in their respective states. Babagana Zulum of Borno State, David Umahi of Ebonyi State, Abubakar Bagudu of Kebbi State, Abdullahi Ganduje of Kano State, Ben Ayade of Cross river State, Aminu Bello Masari of Katsina State, Babajide Sanwo-Olu of Lagos State and Nasir El-Rufai of Kaduna State. Let me use this medium to advise the incumbent governors of Imo and Ogun State, Rochas Okorocha and Ibikunle Amosun, that unless they are prayerful, they will experience political humiliation that will make them irrelevant in their respective states after election. 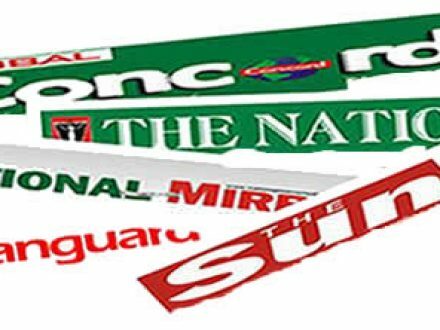 ” The proposed National Conference by President Jonathan would be an effort in futility as it will end up in criticism and confusion“. Global Concord-15//1/ 2014 Page 4. Daily Sun -20/1/2014 Page 54. The Nation – 22/1/2012 page 69. The Nation – 20/2/2011 Page 68. Daily Sun – 3/3/2011 Page 51. Vanguard – 19/3/2011 Page 52. Sunday Mirror – 3/4/2011 Page 29. “The Head of State, General Sani Abacha and his deputy, General Oladipo Diya will have a serious clash.” – This came to pass when Abacha alleged that Diya had planned a coup to topple him and the duo parted ways. MAJESTY WEEKLY – 3/10/1995 PAGE 4. MAJESTY WEEKLY – 3/10/1995 PAGE 4. Amongst Others. PRESIDENT MUHAMMADU BUHARI WILL WIN 2019 PRESIDENTIAL ELECTION – PROPHET EKONG ITUEN. PUBLISHED IN NATIONAL DAILIES: THE SUN 22/12/2018 PAGE 42. VANGUARD 28/12/2018 PAGE 25. TELEGRAPH 29/12/2018 PAGE 43. THE NATION 6/1/2019 PAGE 13. Progressive Congress will win 2019 Presidential election. You may not like him but that is the truth. I therefore urge the religious leaders in the country to refrain themselves from making inflammatory utterances that promotes conflicts and disunity because God gives power to whoever He pleases. The politicians should not consider politics as a do-or-die affair because whatever anyone becomes in life is exclusively in the hands of God. I urge them not to overheat the polity on account of their desperation to get elected “. “A former President of Nigeria will pass on before the end of 2018”. This came to pass when former President Shehu Shagari died on 28/12/2018. “The National Chairman of All Progressives Congress (APC) Chief John Odigie-Oyegun should prepare to face tough days ahead as the battle to remove him is not yet over. I urge him to pray fervently”. Let me start by telling Nigerians that election result will spring surprises but in my revelation, it has been established that President Muhammadu Buhari of All Progressive Congress will win 2019 Presidential election. You may not like him but that is the truth. I therefore urge the religious leaders in the country to refrain themselves from making inflammatory utterances that promotes conflicts and disunity because God gives power to whoever He pleases. The politicians should not consider politics as a do-or-die affair because whatever anyone becomes in life is exclusively in the hands of God. I urge them not to overheat the polity on account of their desperation to get elected. Nigerians should take note that the following governorship candidates will win in their respective states. Babagana Zulum of Borno State, David Umahi of Ebonyi State, Abubakar Bagudu of Kebbi State, Nsima Ekere of Akwa Ibom State, Abdullahi Ganduje of Kano Sate, Ben Ayade of Cross river State, Aminu Bello Masari of Katsina State, Babajide Sanwo-Olu of Lagos State, Nasir El-Rufai of Kaduna State and Adebayo Adelabu of Oyo State, but let it be known to Nigerians that though Mr. Adebayo Adelabu of Oyo State will win his first term in office, I am led by the spirit of the living God to inform him that he will find it difficult to make it for second term. The second term ambitions of Governors Samuel Ortom of Benue State, Ifeanyi Ugwuanyi of Enugu State and Ifeanyi Okowa of Delta State, are very dicey. They should pray fervently and seek God diligently to avert impending defeat. I am urging them to contact a true servant of God of their choice, who are spiritually inclined with proven integrity and undiluted revelation for solution. The second term of President Buhari will be traumatic for looters, as he is going to be ruthless in fighting corruption. He will also revisit the issue of power infrastructure because of the inefficiency in that sector that has hindered the expected economic growth. Furthermore, I forsee heads rolling in the power sector, as Buhari will look into the fraudulent way privatization process was carried out, some licenses will be revoked, and also in the oil sector. In furtherance to my earlier prediction, former President Olusegun Obansanjo will be charged for corruption, he should be prayerful, he may go back to jail the second time. No, absolutely no. I am very neutral and a spiritual father to all. I am a messenger who conveys message from God to humanity and Nations. A true Prophet should not be seen as being partisan, and prophecy should not be seen as hatred or criticism but as part of intelligence reports, warning and a clue to the plan of God which can be prevented if the right steps are taken. It is to be noted that even in the bible, God used prophets to warn leaders of impending crises and defeat. WHAT IS YOUR PERCEPTION ABOUT SENATOR GODSWILL AKPABIO? should prepare to face tough days ahead as the battle to remove him is not yet over. I urge him to pray fervently”. Published in DAILY SUN = 28/2/2016 Page 52. I have the mandate by the Host of Heaven to announce to Nigerians that the coming year 2018 will be far better than the outgoing year. I urge Nigerians not to lose hope because there are better days ahead. 2018 will also be a year of wealth transfer and abundance for God’s people. There will be tremendous improvement in economy in Nigeria. The people of Akwa Ibom state will witness the toughest Governorship election in the history of the state in 2019. Though God has revealed the name of the person that will win the election, which will be made public soon. But for now, I urge Akwaibomites to remain calm. As earlier predicted, the peoples Democratic Party (PDP) will still face the problem of division and disunity as some members will still drag the party to the court. A former President of Nigeria will pass on. Nigerians should pray against a new terror group (ISIS) that will emerge soon in Nigeria. I know many people will see these as bad prophecies, but for those that have ears, let them listen to the warnings from the throne of God because for those he loves, He reveals himself to them. for Christ Deliverance Ministries – CDM, Headquarters, Lagos. .
“… The militancy in NIGER DELTA is not yet over as a group of New militants that will be more destructive will emerge in 2016 ” This came to pass with the emergence of NIGER DELTA AVENGERS. Global Concord – March 25, 2015 Page 11. Daily Sun -15/1/ 2015 Page 47. Concord – 15//1/ 2014 Page 4. ” Peoples Democratic Party(PDP) will be engulfed in a serious crisis that will rock the foundation of the party, as there will be division and disunity in their midst. 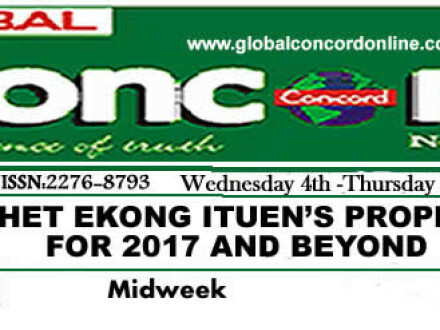 With what I saw in the spirit, the party will not win the presidential election in 2015.” PROPHET EKONG ITUEN. Daily Sun 4/1/2013 page 43. ” ……But God has mandated me to announce to them that the removal of Alhaji Bamangar Tukur will not bring any peace to PDP family, rather it will mark the beginning of the real crisis because there will be a serious defection and disunity in their midst “. Daily Sun – 4/1/2013 Page 43. Concord – 16/1/ 2013 Page 4. ” Governor’s forum in Nigeria will mourn, there is need for them to fast and pray fervently as one of them will die in a mysterious manner “. *This came to pass when Governor PATRICK YAKOWA of Kaduna State died in a chopper crash the same year. NOTE: The fact is that prophecy is a warning and a clue to the plan of God, it can be prevented if the right steps are taken . This came to pass when Abacha alleged that Diya had planned a coup to topple him and the duo parted ways. “Alhaji Aminu Saleh, Secretary to the Federal Government will be in trouble with General Abacha and will be dropped unexpectedly.” This came to pass when no one expected. ” General Sani Abacha transition programme will collapse as God is not in support of his regime.” This came to pass as predicted. 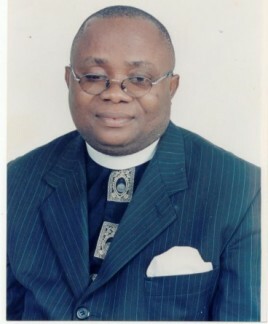 ”……But God has mandated me to announce to them that the removal of Alhaji Bamangar Tukur will not bring any peace to PDP family, rather it will mark the beginning of the real crisis because there will be more defections and disunity in their midst.” PROPHET EKONG ITUEN, the Spiritual Leader of CDM- Christ Deliverance Ministries, Lagos . When it comes to accurate predictions like Nostradamus of old, the man who saw tomorrow, another name that comes to mind is Prophet Ekong Ituen, the founder and spiritual leader of Christ Deliverance Ministries – CDM, Lagos. Ituen, a native of Ikot Nkan in Onna Local Government Area of Akwa Ibom State, highly reputed for his yearly prophecies. 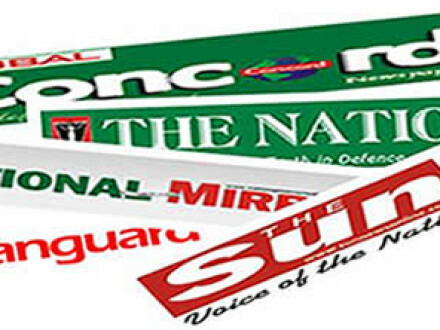 It is on record as predicted that APC would win 2015 presidential election. The political defeat of the former governors of Oyo and Imo states, in the person of Chief Alao Akala and Mr. Ikedi Ohakim, the death of Ooni of Ife, Oba Okunade Sijuwade, PDP crisis and judiciary cleansing in Nigeria amongst others. In this interview, during his Cross–Over Night Service at his Church Headquarters in Lagos, where large crowds thronged in to know the plans of God for Nigeria. 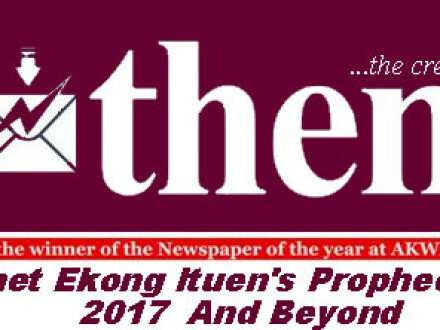 Prophet Ituen reeled out shocking prophecies for 2017 and beyond. Sir, Can we know your predictions for Nigerians for 2017 and beyond? I have seen a great future for this Country, there is hope for a better Nigeria, things will get better, the righteous will greatly flourish. By the special grace of God this country will soon come out of economic challenges. I urge Nigerians to pray for President Buhari and Pastor Osinbajo led government because they have good intentions. Our religious leaders should avoid religious sentiments and sermon of disunity because according to the Bible, “for there is no power but of God: the powers that be are ordained of God”. Furthermore, Nigerians should note the following prophecies as received from God for 2017 and beyond. But it is to be noted that prophecy is a warning and a clue to the plans of God, it can be prevented if the right steps are taken. The government and the people of Oyo State in South West Nigeria should pray against the death of a former governor of the state. Many people will go to jail in Ghana, it is certain in the spirit that the President elect, Nana Akufo-Addo will jail many during his administration. Queen Elizabeth of England needs prayers for good health, I urge the world to pray against a brief illness that will take her life. Governor Willie Obiano of Anambra State needs prayers for 2017 governorship election. In my revelation, I saw him descending from a ladder. I am urging him to meet with a true man of God of his choice with proven integrity for solution, because God has a word for him. Akwa Ibom State needs fervent prayers to avert more disasters ahead, in my revelations, God urged me to tell Governor Udom Emmanuel to organize a solemn assembly with men and women of God who are spiritually inclined with proven integrity in attendance because the devil is out to wreak havoc in the State. One of the State Governor’s wives in Nigeria will not be alive to complete the tenure of her husband. The Governor of Nassarawa State, Umaru Tanko Al-Makura needs prayers to overcome health challenges that may put him out of governance. Honourable Commissioner for Works in Akwa Ibom State Mr. Ephraim Inyang needs divine intervention to overcome evil plots by his political enemies within his party. Let me confirm as earlier predicted that All Progressives Congress (APC) in Akwa Ibom State should pray against confusion in their midst. In my revelation, I saw crisis and division ahead. 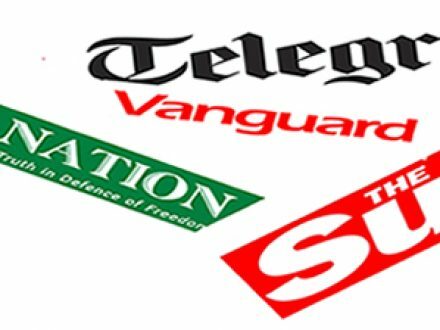 It is a known fact and on record that I predicted as was published in Daily Sun of January 20, 2014 page 54 that All Progressives Congress (APC) would win 2015 presidential election but will have serious leadership challenges. For now, let me use this medium to state here without being sentimental and to the best of my knowledge that His Excellency, Asiwaju Bola Tinubu has been a source of inspiration where many are today. He has made substantial contributions to the survival of democracy in Nigeria. Over the years, I have known him as a caring leader who is loved by his people and has the interest of the masses at heart. I urge APC not to undermine him because he is a strong political force to be reckoned with, an asset to any political party. It is a known fact that I predicted years ago that he (Tinubu) would produce the President of this country, this came to pass when he and few others came up with a party called “All Progressives Congress” that produced Muhammadu Buhari as President. The fiery cleric, the Spiritual leader of Christ Deliverance Ministries – CDM, Lagos, Prophet Ekong Ituen, does not need much introduction because of his accuracy on prophecies. Ituen, a renowned seer who had predicted many national events that came to pass has assured Nigerians of better days ahead. In this interview during his Cross-Over Night Service, the man of God reeled out shocking prophecies for 2017 and beyond. What are your predictions for Nigerians for 2017 and beyond? Many people will go to jail in Ghana, it is certain in the spirit that the President elect; Nana AkufoAddo will jail many during his administration. The Governor of Nassarawa State, UmaruTanko Al-Makura needs prayers to overcome health challenges that may put him out of governance.